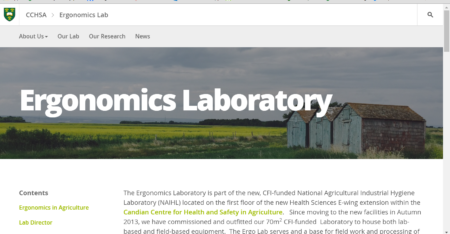 Last week our new Ergonomics Lab website went live… let me know if you see anything awry and I’ll endeavour to fix it. On May 5th we will have an open house to welcome partners and collaborators to see demonstrations in the lab. It has been a long time coming to complete the renovations and order/commission all the equipment so that the lab can be operational; up to now it has mostly been a base for us to do work in the field. This is a milestone; just last week we got our first (small) grant for lab-based research, which will be conducted this summer. It has been a lot of work by a lot of people to get things to this point, so we are looking forward to some good productivity coming up. Previous PostVote online for Research Photo Contest!Next PostErgoLab on TV!